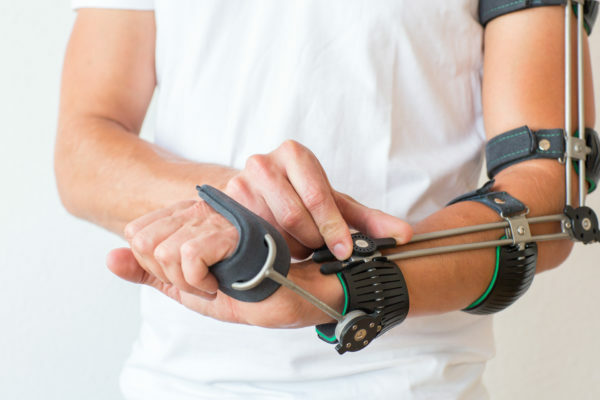 The Ambroise Triple-mode Arm orthosis (ATA) is a lightweight arm orthosis designed for people with loss of control over their arm due to, for example, a stroke, a brachial plexus lesion, a muscle disease or a connective tissue disorder. The consequences of paralysis of the muscles around the arm can be quite drastic. The arm can no longer be lifted properly, so that objects can no longer be gripped, carried or lifted so easily. 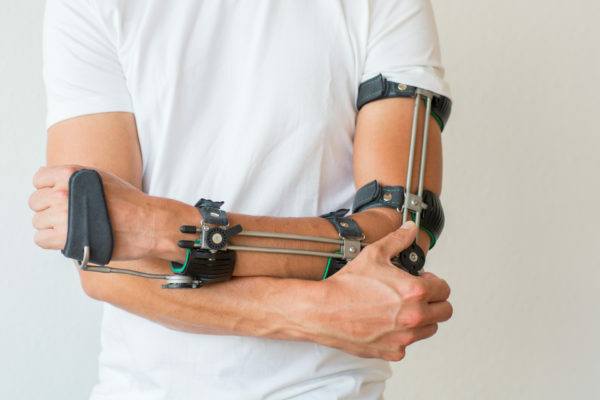 With this, the arm loses an important part of its function. And if that is not enough, you can not keep the arm still. For people with a limp paralysis (eg after brachial plexus injury), this means, for example, that when moving the trunk, the arm starts to move as a result of the inertia, without having much influence on it. This ‘arm swinging’ can be extremely annoying and leads to the arm easily knocking against chairs, tables and walls, whereby the arm or hand can be damaged. For people with a spastic paralysis (eg after CVA) this may mean that the arm is unintentionally pulled into maximum flexion during a spasm. That is at least as annoying. Even in this situation, the arm does not do what it is supposed to do and it is difficult to exercise a function with that arm. If the spasm complaints last longer, it can be painful and lead to shortening of the muscles, so that the arm can not even be stretched completely. A contracture can arise. 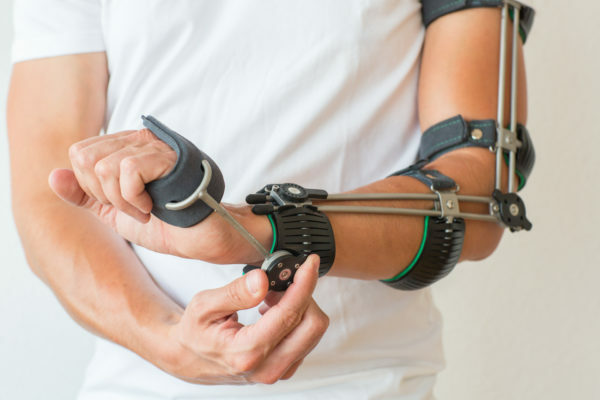 Although the ATA can be fitted with a spring unit that helps to stretch the arm, the Wilmer Stretching Orthosis is more suitable for the treatment of contractures. How do I get an Ambroise Triple-mode Arm orthosis? De ATA is custom made. We do this by using the Ambroise Photo measurement technique. For optimal functioning and good comfort it is important that the orthosis fits well. After all, you need the orthosis every day for the whole day. That is why the ATA is also fitted and adjusted by professionals (orthotists). The ATA is prescribed by your attending physician. In most cases that will be the rehabilitation physician. In many cases, however, approval must be requested from your insurer. Do you want a non-binding advise from one of our clinical experts about the possibilities of an Ambroise Triple-mode Arm orthosis in your situation, or do you want to know which professionals in your area have experience with this orthosis? Feel free to contact us. We are happy to assist you. The basis of the ATA is an elbow hinge that can be set in three operation-modes. The first operation-mode is the free mode. In this setting the hinge allows free movement. In the second mode, the hinge is set to an adjustable resistance. This allows the user to individually set at which force the hinge starts to move. In this setting the user can, for example, move the elbow (by means of his other hand, or by residual function in his muscles) to a different position and rest there in that position. The third mode is the blocked mode. When the adjustable resistance is brought to the maximum, the elbow joint is completely locked. The arm can then remain at rest in the selected elbow position and withstand external forces, for instance by carrying something. 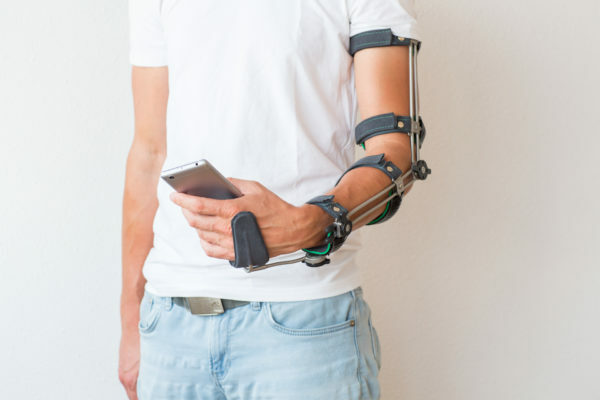 The ATA can also be equipped with a wrist-hand unit. This unit has two degrees of freedom. The first is dorsi and palmar flexion (lifting or bending of the hand). This allows the hand to be lifted or bent. The second is pro- and supination (turning the hand in or out). With this the orientation of the hand can be changed. Both wrist hinges have the same three settings as the elbow hinge: completely free, adjustable resistance and completely blocked. In this way the hand can be brought into the correct position and locked there. Depending on the residual function of thumb and fingers, the possibilities of carrying out a task with that hand can be increased, for example, by retaining, holding or carrying an object. The hand can recover part of the function of the ‘non-dominant hand’. That is to carry, stabilize or hold back objects. You should, for example, think of holding the handle of the frying pan. For this the hand must be turned into pronation (palm down). If you can hold the frying pan like this, you can stir in the pan with your other (good or dominant) hand. But for holding your mobile phone, that state of the hand is not at all ‘handy’. Then just a little more supination of the hand is preferred. With the ATA you can orient and position your hand in such a way that different tasks suddenly become possible. This makes the ATA a revolutionary arm orthosis.